Fasthosts has been in the business since 1999 and boasts of a proven track record that includes 1 million domains running smoothly and over 42 million emails are delivered safely on a daily basis. Located in the United Kingdom, FastHosts plays a critical role in pushing British businesses to success with its fast and secure hosting services powered by five data centers and around 70,000 servers. Fasthosts is also one of the largest web hosting providers in the world. 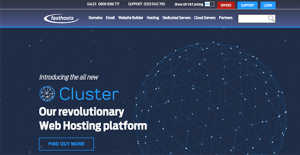 The experienced hosting provider is described as the next-generation cloud platform that lets users build attractive websites and e-shops with their preferred domains, and have those hosted with unparalleled reliability and scalabilty. Fasthosts specializes in cloud servers, web hosting, and dedicated hosting packages, but will also supply interested users with a wide choice of email services (standard email, exchange essentials, Office 365). The company prides itself with one of the best control panels in the industry from where users can manage with ease all of their products and services. To protect your data, Fasthosts enables Private Networks, Firewalls, VPNs, SSL certificates and full server backups; as well as 24/7 monitoring and agent support. Pricing is very affordable, with plans starting at only £2.50 per month. FastHosts promises to deliver 99.99% availability and uptime to all its sites. The company employs superior hardware and advanced technology to provide users with fast and secure hosting services, including the advanced Ruby on Rails (mod_rails interface) and Python using Phusion Passenger (Web Server Gateway Interface). How Much Does FastHosts Cost? FastHosts offers cPanel and WHM web management tools for fast and easy management and administration of several aspects such content, website and server stats, emails, and files. Every business is different, and may need a particular type of solution that will be fit for their business size, type of clients and staff and even particular niche they deal with. You should not count on getting an ideal service that will be suitable for every business no matter what their background is. It may be a good idea to read a few FastHosts reviews first and even then you should pay attention to what the hosting service is intended to do for your business and your employees. Do you require an easy and intuitive hosting with only basic functions? Will you actually make use of the advanced tools required by pros and big enterprises? Are there any specific features that are especially practical for the industry you operate in? If you ask yourself these questions it is going to be much easier to find a trustworthy service that will fit your budget. We realize that when you make a decision to buy Hosting Services it’s important not only to see how experts evaluate it in their reviews, but also to find out if the real people and companies that buy it are actually satisfied with the product. That’s why we’ve created our behavior-based Customer Satisfaction Algorithm™ that gathers customer reviews, comments and FastHosts reviews across a wide range of social media sites. The data is then presented in an easy to digest form showing how many people had positive and negative experience with FastHosts. With that information at hand you should be equipped to make an informed buying decision that you won’t regret. FastHosts offers UK-based support for their clients. Support channels include telephone lines for sales and support inquiries, email, social media, and traditional post. FastHosts also provides a knowledgebase, PDF guides, and webinars for training. An online community of FastHosts clients is also a good source of information and support. What are FastHosts pricing details? While FastHosts does not provide unilimited email accounts, users can thoroughly enjoy the firms unlimited bandwidth feature. Yes. Users receive 1 year free domain registration with every hosting plan from FastHosts. Yes. Users can opt to use WordPress as their content management system of choice if they choose FastHosts. FastHosts accepts payments via major credit cards, PayPal, and Stripe. FastHosts comes with a user-friendly website builder integrated with SEO and social tools to help users create websites from scratch that are appelaing both to search engines and social media users. FastHosts promises to deliver 99.99% availability and uptime to all its sites. The company employs superior hardware and advanced technology to provide users with fast and secure hosting services. Clients can avail of a days’ worth of free hosting for every hour of downtime. Yes. FastHosts hosting packages are equipped with many eCommerce features, including one-click applications for commerce/storefront purposes. FastHosts has its own data center located in Gloucester in the UK. The facility is manned and monitored 24 hours a day and is installed with the latest and best equipment, security systems, and backup power systems to keep them up and running in the event of a power failure. Yes. FastHosts supports both Windows and Linux web hosting services. If you need more information about FastHosts or you simply have a question let us know what you need and we’ll forward your request directly to the vendor.